The highly respected STEEL PROPHET, hailing from Van Nuys in California, deliver technically minded Progressive Heavy Metal. The band was actually assembled in Middletown, Connecticut during 1983, at first involving guitarist Steve Kachinsky Blakmoor, frontman Gary Stocking and drummer Harry Blackwell. A four track demo was recorded working with co-producer Mike Arafeh. A second set of songs, billed 'Resurrection' and recorded at The Center for Media Arts in New York, again saw Mike Arafeh behind the desk with a third session, in 1985, tracked at The SynHouse. The band then evolved, drawing in singer Dave Brooks, bassist Wayne Faircloth and John Tarascio on drums to record a song 'In The Dream', donated to the 'Iron Tyrants Vol.2' compilation album in 1987. 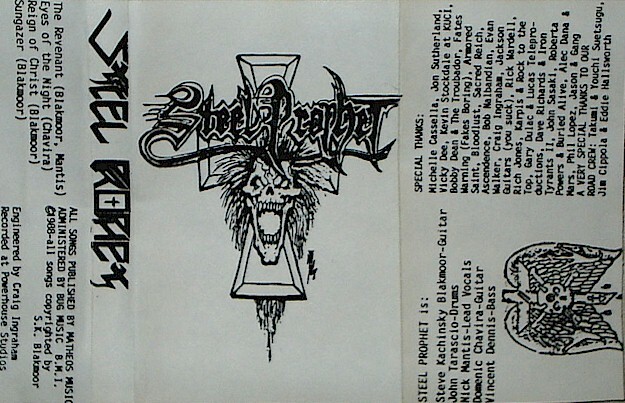 STEEL PROPHET would then commit to the studio for the 'Steel Prophet' demo tape. In 1988 Kachinsky Blakmoor and Tarascio relocated to Los Angeles, California, re-building an all new STEEL PROPHET with vocalist Scott Lindsenbard, guitarist Domenic Chavira and bassist Vince du Juan Dennis. Before long Nick Mantis of ASCENDENCE usurped Lindsenbard and the group's next effort, 'Visions Of Force', was released by Tru Star Entertainment. in 1988. Still in flux, the band pulled in new second guitarist Jon Paget and Rick Mythiasin, having a fleeting association with PANTERA, as new singer. 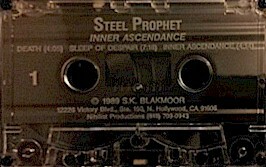 Yet another demo, 'Inner Ascendance', arrived in 1989. The group signed to Foundations 2000 Records, cutting pre-production tapes in anticipation of an album release. When no schedule was forthcoming, the band self-financed their commercial debut. 'The Goddess Principle' album was released in 1995 on the Brainstorm Division imprint. Xeroxed two panel covers. Tapes varied. Another version exists? Pro printed covers w/ lyrics on the back. Pro printed tapes.